Out of all the locations in Langkawi, Pantai Cenang would top the list when it comes to number and diversity of dining choices in the island. As you stroll along the main road Jalan Pantai Cenang, you will notice the line of restaurants on both sides of the road. During the day time, most of these restaurants remain somewhat lackluster. But in the evening, when the lights are lit up with hundreds of tourists and locals thronging the street, these restaurants and eateries spring into action, join the festivity and add to the amazing & colorful ambience. As you walk along the street, you will find restaurants either displaying live seafood like in aquariums giving choice of your pick, or many others displaying frozen seafood in glass cabinets. A common sight is a board displaying 'Ikan Bakar' meaning charcoal grilled fish or seafood. I have also observed that many budget restaurants in Pantai Cennag which do not have bars of their own, actually allow you to bring your drinks from outside and consume it while you dine in the restaurant. However, some of them clearly display a board saying 'No Outside Drinks Allowed'. Most restaurants in Pantai Cenang are open until late night, some even beyond mid-night during the high season. There are a few, that remain open round the clock. Here are the best restaurants in Pantai Cenang. I have indicated their category (i.e. budget, mid range or upscale) as well as the cuisine along with each. Note that most restaurants would add a 10% service charge to the bill amount. You won't here much bout this unassuming restaurant, which has an open air dining on the front side. There are shades for individual seating spaces and with candle lit tables, the place looks quite nice in the evening. Right at the entrance, you can select your seafood from the frozen glass aquarium by weight and they will grill it for you. The grilling area is also located next to the seafood display tanks, so the area can become a little smoky at times. They also serve grilled chicken and other local dishes. Good value for money. The restaurant is located on the roadside on Jalan Pantai Cenang. It serves dinner. This is a casual friendly eatery operating since March 2010. You can find many Chinese and local customers hanging around waiting to eat authentic Chinese preparations.... the specially here is the seafood. You have the option of choosing live seafood from aquariums including crabs, tiger shrimps, large ming shrimps etc. Live seafood is weighed and accordingly priced. You won't get cheap & nice breakfast in too many places in Pantai Cenang as most of the small eateries and restaurants remain closed in the morning hours. Breakfast Bar provides a good relief and an a nice option for a budget breakfast. Other than eggs made to order, toast with ham, butter, jam, tea, coffee, you also get local choices like Nasi Lemak (a spicy local rice dish prepared in coconut water and pandan leaves and served with lamb curry, eggs, peanuts, vegetables etc). Breakfast Bar is located on Pantai Cenang main road (near Malibest Resort) and closes by 2pm. This is a very popular restaurant with both locals and tourists, and located right on the road side with large seating area. Often packed, you won't care much about the ambience as you walk in, rather focus on the food. There are several glass tanks outside full of live seafood that you can choose from. However, frozen seafood are cheaper. Some of the heavily sought after items include the lobster and tiger prawn dishes which they prepare in different style to suite your taste. They are open for lunch and dinner. This restaurant is part of the Beach Garden Resort. The restaurant is located at the end of a short tree-covered pathway. The Beer Garden is right on the beach with an illuminated wired fence separating it from the public area. The indoor part of the restaurant is decorated with Balinese masks giving it a look of a typical Bavarian breakfast room. The Beergarden with its covered shades, coconut trees and wonderful view of the water is a lovely place to have a cocktail as you watch the sunset and dine. Other than great seafood prepared in local or western style, the restaurant also serves several pasta, pizza, chicken and beef dishes. It's open for breakfast, lunch and dinner. But Danny's friendly chat and the cafe's inviting atmosphere makes up for it. You are after all on a laid back holiday. They have nice selection of cocktails as well. Good value for the happy hour drinks. You will get Corona and other beers here as well. Although the restaurant is small, it often gets crowded and the prices are not cheap either. 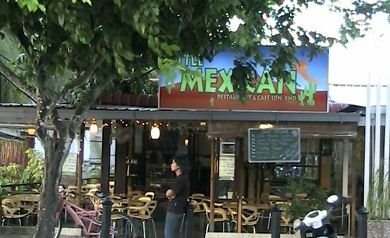 This is a casual friendly restaurant located on Jalan Pantai Cenang roadside and opposite to the Langkawi Boutique Resort. Tandoor items are nice and so are the curry items like Chikken Tikka Masala. You will find a lot of Indian tourists here having hearty meals at reasonable price. They also serve both alcoholic and non-alcoholic beverages. Rakhmal from Bangladesh is the smiling man at the counter and also doubling up as a waiter. The restaurant is open for lunch and dinner. Sitting right on the rocky cliff that separates Pantai Cenang and Pantai Tengah beaches, this restaurant is known to provide an amazing view of sunset. It has three sections - a restaurant, a cocktail lounge that has a bar at the center, and a garden seating by the water. All three sections have great views of the water. The seafood preparations in authentic Malay style are top class and so are the continental and tapas dishes. This is located inside the Bon Ton resort and is meant for those having good amount of money in their pocket and wanting a superlative fine dining experience. Other than many eastern and western dishes, they also serve Tapas, pasta and even Nyonya (Chinese & Malay fusion) dishes. Great cocktail selections. The restaurant is open for lunch and dinner with separate menus. Worst Thai foods we ever had in our life. That's because Langkawi is near to Thailand. We believed that Thai foods should as delicious as Thailand. We were full of excitement needed some Thai foods in Langkawi. We went to Sawadee Thai Restaurant which is near Pantai Cenang with empty stomach. It was so disappointing! The foods are disgusting! We totally spent nearly RM90 for worst foods in our life. The special squid was made from fishy squid with only black pepper on top, gosh! The bean curd dish also just with some Thai Chilli sauce on top. Mango kerabu also sucked! Taste too sour, salty and fishy with ikan billi head and peanuts with skin. We were totally unable to swallow at all. White Tom Yam was very very fishy, could smell the fish before putting into our mouth. Staffs also with bad service. Do not recommend dining in this restaurant at all. You can try Tomato Nasi Kandar in Pantai Cenang.